Retail $5.51 SAVE 23% ! "Enamel Paint Marker has the runs!" This idea is a good one, but unless you&apos;re going to use it to paint an entire area and wouldn&apos;t be concerned about paint quality, than this is the right product for you. If you&apos;re trying to paint a fine line or small area and have to go slow, the paint will start to run and you&apos;ll end up with run lines or blotchy dark spots in your paint area. It&apos;s best to mask off the area, and spray with a airbrush. 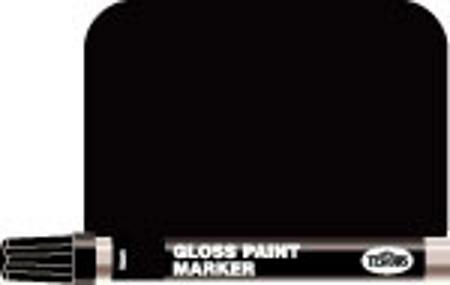 Marker is carded and packaged for clear visibility, with Black color on front. Our company uses these frequently for fixing small blems in material. "Good for some detail work"
I like to use these markers on doing trim, or other things. it&apos;s a lot cheaper than buying paint to do those small things. all you have to do is mask of the area you want, and run over it a few times with this pen... Ta-Da! It&apos;s done! I also use these on seats in model cars, because it allows you to do an easy two tone paint job on them, without having to worry too much on paint seeping into crevices. Does good on line detail and for fast touch ups. Can use to pain with some but wouldn&apos;t suggest using them unless you get a few .